Parasites are an unavoidable part of life, inhabiting millions of Americans, and can be found in nearly every type of environment . Many parasitic conditions such as Babesiosis, Cryptosporidiosis, and Giardiasis often bring with them a slew of symptoms and health issues that aren’t easily ignored. However, many other parasites can thrive in the human body for years without causing any noticeable side effects . One way to help prevent parasites from taking hold is to do a parasite cleanse from time to time. Parasites are tricky beasts, and it is best to have several different herbal blends in order to avoid their building a tolerance. For example, you might take one product one month, then another herbal blend the next; so on and so forth. Parasites can come from nearly any source; pets can bring them in, undercooked meats can contain them, or they could even be lurking on those delicious open-air salad bars you find in the grocery stores. Needless to say, trying to avoid exposure to parasites altogether is a fool’s errand. To help safeguard yourself against the throes of parasites the best offense is a good defense. That’s to say; assuming you’ve got parasites in your body and undergoing periodic maintenance cleanses is likely a better approach than trying to simply avoid them. If you own animals, spend time in natural water sources, eat meat, eat raw or unwashed vegetables—you have a much higher risk of contracting parasites than most people, but also fall into the majority of lifestyles. 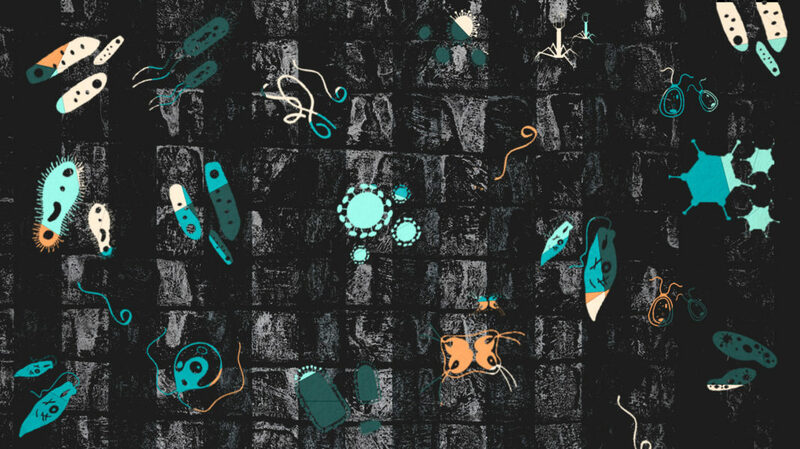 Parasites are everywhere and nearly everyone is at risk for infection. To safeguard against these types of infection, many health professionals and doctors alike recommend performing a parasite cleanse a few times each year, and taking supplements a few days each month to prevent parasite infections. These types of treatments are easily administered, don’t involve any prescription medications, and in most cases don’t even disrupt one’s daily life. In cases where the presence of parasites has been confirmed by laboratory testing, many health professionals will prescribe a pharmaceutical medication for the targeting of the specific parasite. These medications, often ending in –zole, include such products as Ivermectin, Albendazole, Mebendazole, and in some cases even hormonal drugs such as Prednisone . These medications are generally regarded as safe but each come with many listed side effects such as seizures, swollen hands, swollen face, shaking, trembling, skin rashes, fever, diarrhea, and itching. Fortunately, there are many natural parasite cleanses and treatments that have been proven effective—often more so than pharmaceutical treatments . These natural methods of treating parasites have recently seen a renaissance of popularity which has given rise to many products available on the consumer market. Another trick in the treatment of parasites is the use of enzyme supplements during treatment protocols. These powerful supplements provide many other health benefits as well such as immune boosting, weight control, food intolerance & sensitivity, soreness, and many other issues. However, they are particularly good at helping to ‘chew up’ parasites and microbial nongrata, weakening their defenses to help parasite cleanses more effective. While many different enzyme products are able to provide this type of support, two of the most-recommended by health professionals are Interfase Plus by Klaire Labs and Bromelain Plus CLA by Biotics Research. These supplements should be taken between meals or first thing in the morning on an empty stomach—otherwise, they are generally utilized during digestive processes and aren’t lending a hand towards the cleansing of parasites. 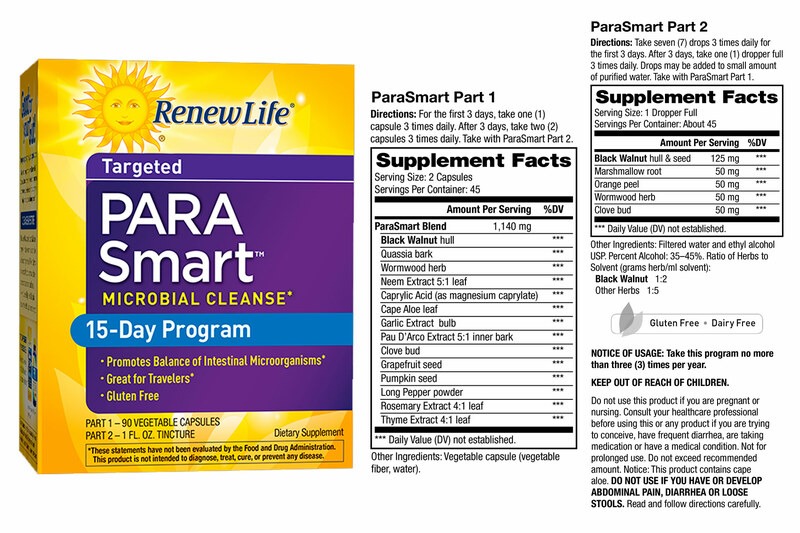 ParaSmart from RenewLife is what is considered a ‘kit’, which includes all you need to get started, as well as a follow-up treatment course to address newly hatched parasites. 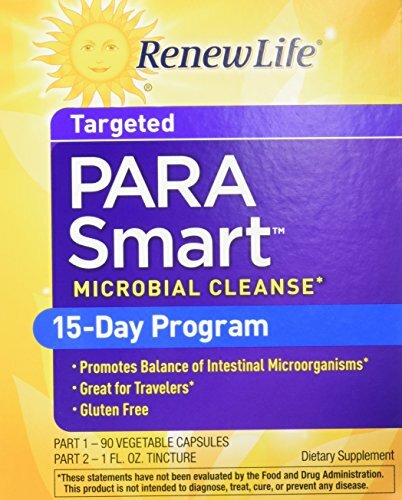 ParaSmart from RenewLife includes a long list of powerful herbs proven to treat parasites and infections such as wormwood, caprylic acid, garlic, and quassia bark. The first course of treatment lasts for 6 days and involves the taking of vegetable capsules. While these herbal anti-parasites are known to knock out parasites, eggs and larvae can sometimes survive and hatch out later. The second course of treatment, to be taken for 9 days, involves a liquid herbal extractive and is used to address these later-hatched parasites. This type of staggered treatment approach helps to ensure that not only are active parasites treated, but the eggs lying dormant are also able to be addressed again during the second course of treatment after they have hatched. RenewLife is popular for their quality probiotics and supplements addressing intestinal and digestive support. Intestinal Tract Defense from Herb Pharm contains Fresh black walnut (not dried), Wormwood Flower, Quassia, Clove, Cardamom, and Ginger, all suspending in an organic cane alcohol solution. This particular product is of excellent quality and can be utilized in monthly maintenance practices for people that feel they would benefit from proactive parasite prevention. This product is best suited for broad treatment and contains mostly organically grown wild-harvested non-GMO ingredients. 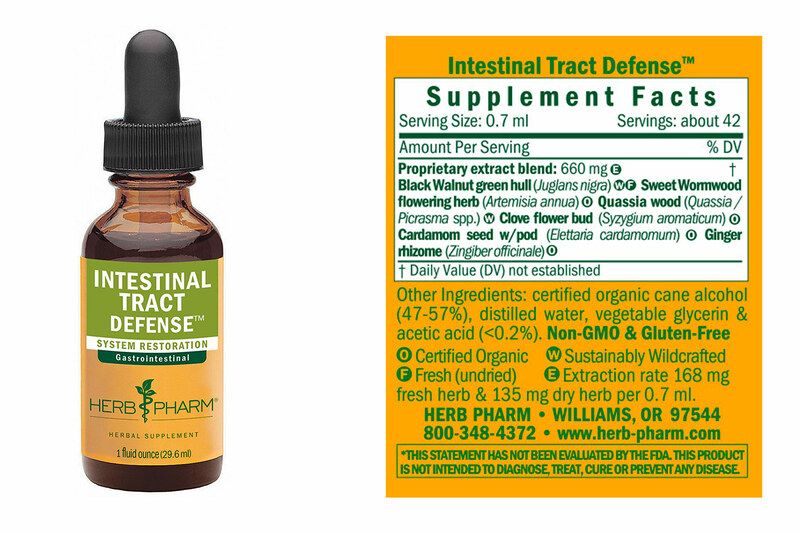 The Intestinal Tract Defense by Herb Pharm is a powerful herbal extractive and is recommend to be taken between meals, and considerably diluted with water. When 30-50 drops are added to an 8oz glass of water, it has an almost-pleasant herbal flavor. This product can be found in local health food stores, some large chains, and readily online through retailers such as Amazon.com. This herbal blend is excellent for those looking for a monthly maintenance parasite product. 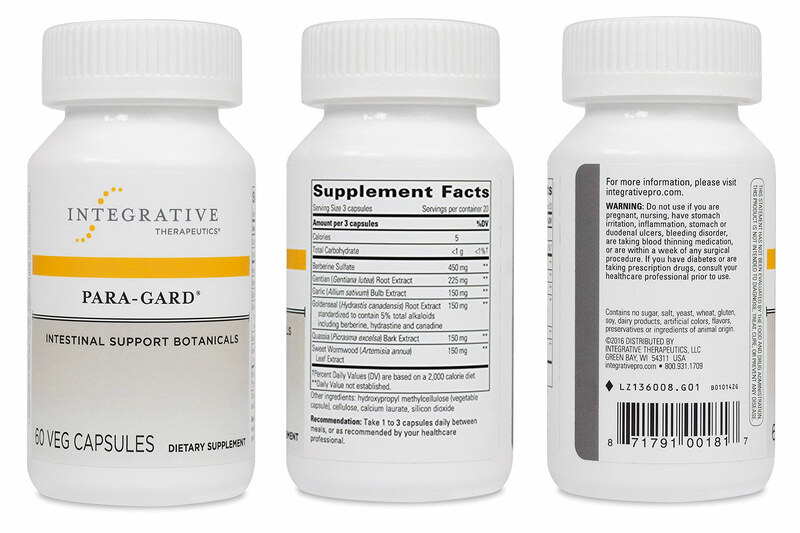 The Para-Gard parasite cleanse from Integrative Therapeutics is an herbal blend consisting of Berberine, Gentian Root, Garlic, Goldenseal, Quassia, and Wormwood. These powerful ingredients have been formulated by Integrative Therapeutics to allow maximum absorption and availability of bio-alkaloids. This product is free of allergens such as gluten and dairy, vegan-friendly, and can be used as a powerful parasite cleanse or scaled-back for monthly maintenance doses. Integrative therapeutics are among the best supplements on the market, considered to be a ‘doctor-trusted brand’. These products are used and trusted by licensed health practitioners around the world to help their patients address health concerns. As with most antiparasite treatments, Para-Gard is recommended to be taken between meals, and ideally in conjunction with an enzyme treatment containing Bromelain, such as the Bromelain Plus from Biotics Research. Finding the best parasite cleanse for your personal needs is a matter of analysis, experimentation, and assessment. Having any available laboratory tests to confirm the presence of parasites and the type of parasites present will make everything easier. Even still, not everyone responds to parasite cleanses in the same manner. The cleanses reviewed here are herbal cleanses regarded as being suitable for frequent, periodic use. Compared to prescription anti-parasitic medications they are much milder and have fewer side effects. Talking with your doctor to establish and understand and initial parasite cleanse, followed by a periodic “maintenance” cleanse can help ensure you’re safeguarded as much as possible. Parasites are all around us; in the foods, we eat, then animals we love, and the world on which we tread. A parasite cleanse is a great form of preventative health that can help give you confidence that you are taking powerful steps to fortify your body's defenses. A combination therapy of enzymes and herbal treatments are recommended by most health practitioners, and are available online or in some local health food stores. U.S. Center for Disease Control. “Are Statistics Available?” Centers for Disease Control and Prevention, Centers for Disease Control and Prevention, 10 Mar. 2014, www.cdc.gov/parasites/references_resources/stats.html. Firger, Jessica. “CDC Warns of Common Parasites Plaguing Millions in U.S.” CBS News, CBS Interactive, 8 May 2014, www.cbsnews.com/news/parasites-causing-infections-in-the-us-cdc-says/. Wikipedia. “Parasitic Life Cycles.” Wikipedia, Wikimedia Foundation, 1 Feb. 2018, en.wikipedia.org/wiki/Parasitic_life_cycles. Global Health. “Health Professionals.” Centers for Disease Control and Prevention, Centers for Disease Control and Prevention, 30 Jan. 2017, www.cdc.gov/parasites/health_professionals.html. Willcox, M L. “A Clinical Trial of ‘AM’, a Ugandan Herbal Remedy for Malaria.” Journal of Public Health Medicine., U.S. National Library of Medicine, Sept. 1999, www.ncbi.nlm.nih.gov/pubmed/10528960. Zimecki, M. “The Lunar Cycle: Effects on Human and Animal Behavior and Physiology.”Postepy Higieny i Medycyny Doswiadczalnej (Online)., U.S. National Library of Medicine, 2006, www.ncbi.nlm.nih.gov/pubmed/16407788.